Hand hygiene requirements can put nurses in a constant cycle of hand washing, rubbing alcohol hand sanitiser into their skin and wearing gloves. While this regimen is a vital part of protecting the health of patients and staff, it can lead to sore, dry and cracked skin. The difficulties caused can go beyond the discomfort and pain of dermatitis, and it can ultimately prevent a nurse from doing their job. Helen O’Boyle, an intensive care nurse at a London trust, was left with red, split and bleeding hands after her skin became damaged by constant hand washing and glove use early this year. She was almost in tears from the pain, and was wearing gloves more to protect her broken skin. She went to see the occupational health team and was distressed to be told she might have to move to a different department with less intensive hand hygiene demands. This prompted her to see her GP, who gave her steroid cream and a gentle soap substitute. She also found a good hand cream, designed for nurses and people who wash their hands a lot, and reduced her reliance on gloves. Damaged, broken skin can prevent effective hand hygiene and leaves a nurse more likely to pick up skin infections. For some nurses this can mean having to move away from roles that demand intense hand hygiene, such as theatre or intensive care nursing, or have breaks from clinical work while their hands heal. This can limit career choices and put more pressure on depleted teams. Accurate figures on the number of nurses affected by dermatitis on their hands are difficult to find. The Health and Safety Executive estimates that each year in the UK 1,000 healthcare workers develop work-related contact dermatitis, nearly seven times higher than the average for all professions. But the RCN says this statistic is the ‘tip of the iceberg’, with many more likely to be suffering. Hand wash or hand rub? While there has been a lot of work to improve the tolerability of products such as alcohol rubs, it appears that skin problems are increasing. The University of Manchester found that healthcare workers were 4.5 times more likely to suffer from irritant contact dermatitis in 2012 than in 1996. The researchers attributed this to the drive to improve hygiene. In a study involving more than 9,000 healthcare staff in Sweden, 21% reported hand eczema. In their daily work, 30% reported hand washing with soap more than 20 times, 45% used hand disinfectants more than 50 times and 54% wore gloves for more than two hours. The more people washed their hands with soap and the longer they wore gloves, the more likely they were to report eczema, according to the study published in the British Journal of Dermatology. Tools of the Trade, a new publication from the RCN, emphasises the importance of correct glove use and hand hygiene, both for patient and healthcare staff safety and to protect nurses’ skin. Currently there is confusion among some staff about when gloves should be worn, leading to them being worn more than necessary. RCN professional lead for infection prevention and control Rose Gallagher says: ‘We know dermatitis is a problem and we also know it is underreported. One of the big problems is awareness. by constant hand washing and glove use. 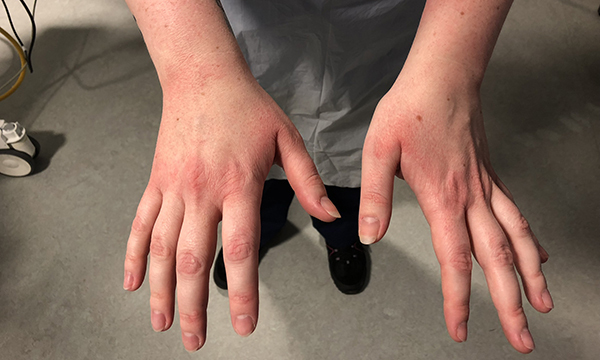 The college has published photographs of hands affected by dermatitis that can be put up in healthcare settings to help nurses assess whether they are affected, and how severely. The nature of nurses’ work means regular contact with potentially irritating chemicals, water and other products. Contact dermatitis is caused by an irritant or allergen, which can include chemicals found in soap, gloves, wipes, some detergents and drugs including steroids and antibiotic solutions. Rubbing the hand against the allergen or irritant can make the condition worse, while repeated contact with water can damage the skin. Prolonged use of water and extended periods of glove use prevents sweat evaporation, making the skin soggy and disrupting its barrier function. Cold weather and low humidity can also have a drying effect on the skin, leading to an increased risk of skin problems. All of these factors can lead to signs of dermatitis, including redness, warmth, small blisters, swelling, cracked or weeping skin, itching and skin infection. Looking after the skin while sticking to hand hygiene protocol is essential, according to the RCN. It has launched posters to encourage nurses to use gloves only when necessary, as they are not a substitute for hand hygiene. Regular use of hand creams or conditioning creams after hand washing and at the end of each work period should be encouraged. When there is a problem, nurses are urged to take action as soon as they spot symptoms, rather than waiting for the condition to become entrenched. Under health and safety regulations, employers should put in place procedures to check the skin of workers exposed to the risk of occupational contact dermatitis. Known as health surveillance, skin checks are used to identify cases of occupational contact dermatitis at an early stage while it is still reversible. Some organisations carry out skin surveillance at regular intervals, such as monthly or yearly, as well as six weeks after a staff member starts in a role where there is exposure to known irritants or allergens. Staff can then be referred to occupational health teams promptly. Source: RCN leaflet Are you glove aware? Aseptic technique: how do we achieve best practice across diverse settings?